I recently got a Lego Mindstorms robotics kit for my mom, and we’ve been working together to build some of the projects. It’s unique how quickly we assign human-like characteristics to things. All I had to do was move the robot and turn it a little, and her mind filled in the rest, reading emotions like curiosity and playfulness into the robot’s actions. It’s a useful trick to remember when writing and creating characters. You don’t need a lot to make something seem human, or to give the illusion of depth and emotion. Humans are great at ascribing emotions to things. You really just need to plant some seeds, then stand back and let your audience come to their own conclusions about the character. After all, no emotional statement is as strong as the one that the viewer makes for themselves. Let’s jump into the first exercise. 1. Convert one of the script samples from Appendix A into one of the other formats discussed in this chapter. 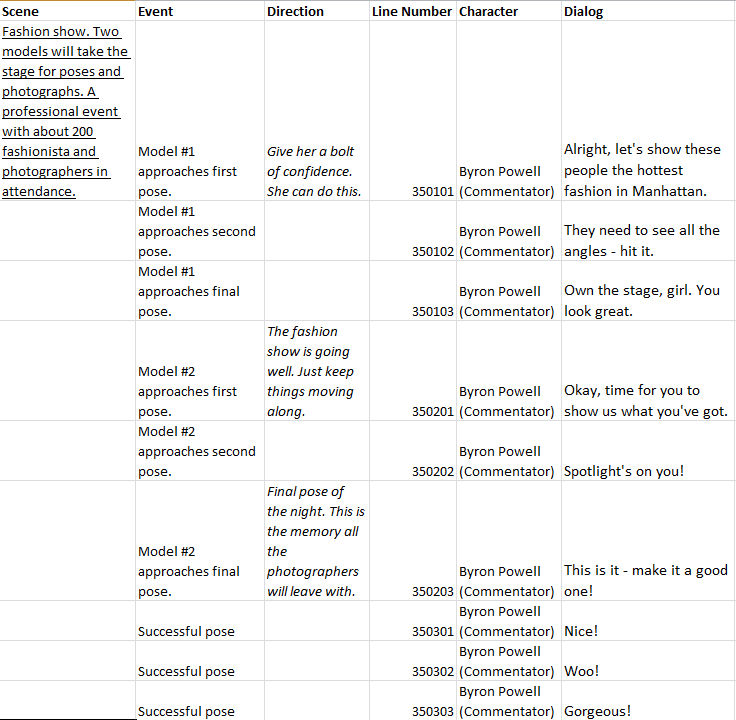 I’ll convert the Bratz: Forever Diamondz script into something more friendly for voice work. I’ve worked with tracking speech lines quite a bit before, so I made sure that my numbering was logical: two digits denoting the scene (3-5), two digits representing the character or event, and two digits marking the individual line. I also found it important not to give too much vocal direction; it was tempting to make notes about how to deliver each line, but I decided that I’d rather just see what direction the voice actor will take the script. Professional Techniques for Video Game Writing has been a pleasure to read. I’ve had an opportunity to do quite a bit of writing at SuperSecret and Kabam, and the advice given by the various authors rings true for my experience. This book gives the impression of a heart-to-heart from the authors, sharing their tips on very specific topics (such as giving direction to voice actors, or writing a manual). The book is structured as a collection of essays by different writers; each one goes into depth on a specific topic, giving realistic advice in their own tone. There’s a lot of range in tone and style (including one author with a slightly-overdone tendency to put jokes in the footnotes). The chapters end with writing prompts and exercises, and I think that once I finish the book, I’ll go back and start doing some of those exercises and posting them here. One thing that Professional Techniques doesn’t address significantly is the writing career path; this isn’t a ‘how to break in’ book. There’s an assumption that you’ve done some writing, and you may have the opportunity to do more. What it will do is give you the tools and the forewarning to do a great job with any opportunities that come your way, and ensure that you’ll be invited back to write more in the future. Amazon.com: Professional Techniques for Video Game Writing (9781568814162): Wendy Despain: Books. At work recently, we had a revision of the Edgeworld storyline, with the hopes of bringing more story into the game in the future. It got me thinking about writing, and exploring the possibilities of a career writing for games. In almost everything I’ve done so far, I’ve succeeded thanks to the written word. At SuperSecret, I took over writing duties in WorldBuilder, and built out quest stories and NPCs. At Kabam, I was never too thrilled by customer service, but I succeeded by writing comprehensive and well-thought-out responses. As a Community Manager, I’m constantly wordsmithing, finding new ways to give bad news and good. So, I’m going to start a redesign of this site to focus more on my writing, and read some books on writing for games. Next should be a mod or mission pack for an existing game; something where I can focus on writing. This could be really good!